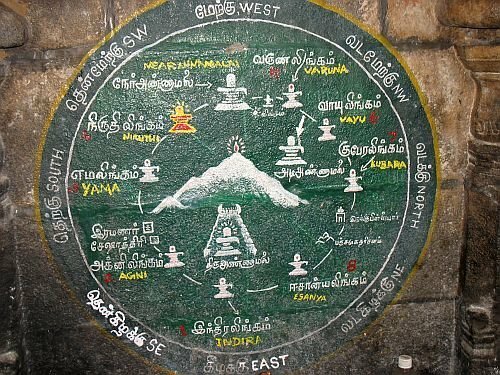 "Arunachala Siva - On the Girivalam Path" by Dr. Bharat Bhushan imagines stories at each of the Asta Lingams on the perimeter of the Girivalam Roadway around Arunachala. Those stories have been created from memories of ancestral tales, legends, folklore and the experiences of pilgrims. Lord Chandra (Moon) is the dominant Navagraha of Agni Lingam. Lord Agni, is the God of the fire of Knowledge. He has seven hands and seven tongues. Agni is the light of the lives of all creatures and is invoked in the performance of Homa. 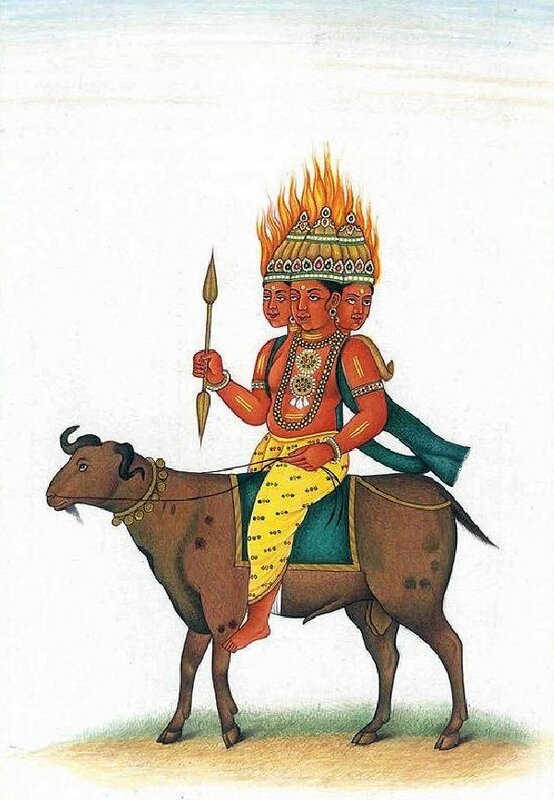 His vehicle is the goat Saga who serves as the sacrificial beast in the fires of Homa. Worshipping this Lingam helps devotees get relief from disease, to maintain good health and also helps them face problems and difficulties in their lives. "Arunachala!" He thought to himself, "Protect me, tonight!" His father had warned him repeatedly in his school days, "The eldest son or the only son should not walk alone after midnight in the open. Demons and ghosts will catch you." And, for good measure, he had added, "Lightning in a thunderstorm can recognize the eldest son. In a stormy night, it will come searching for one, and will hit you, even if you are in a crowd!" Balaji Naidu wondered about his father's words as he looked up at the silhouette of Arunachala, the ever merciful peak of Tiruvannamalai, hidden in the stormy night clouds, with the moon nowhere to be seen. The bus journey had been very tiring. He had not been able to get the express bus and had somehow managed to get on the regular inter-city bus from Chennai. The normal 3-4 hour bus journey by an express bus took longer in this one, stopping at every small mofussil location. The seats had been extremely painful, and Balaji Naidu was exhausted. It was past midnight, long past midnight, at Tiruvannamalai. There was a rainstorm pouring down and he had no umbrella or raincoat with him. The streets were empty, and he searched the skies for protection from the silhouette of Arunachala, with the moon behind. The city had gone to sleep in this storm, and he walked alone, talking to himself, "O Balaji, do not be frightened. This rain will not harm you. Demons and ghosts will not come for you. With Arunachala Shiva as your protector, this storm will not even attack you with its lightning." He walked from the bus stand and past the great temple. He had to get back to the lodge, but it was too far away and there was no transport at this hour past midnight. The roads were empty and he was frightened. He had come all the way from Chennai and wanted to walk on the Girivalam, the path around the sacred hill of Arunachala Shiva. He would have to start on the fourteen kilometer walk, maybe early dawn, and be able to complete the entire route before it would get too hot. It did not look like he would be able to reach the lodge in the pouring rain, he thought. He was near the Agni Lingam temple. He knew that the temple would also be closed at this time of night, for this was not the date for the Girivalam. He remembered that there were some shops nearer to the temple and they would be closed now. He could take shelter in their shaded shop fronts. He turned into the lane for the Agni Lingam temple and came up to the shops. As he had guessed, the shop front was dry, and the awning would protect him. He could rest here for the night, in front of the Agni Lingam temple. He could see the sacred Arunachala, resplendent in the thunderstorm. It was lit up by the moon and the silhouette made the peak look very magical. Balaji was drenched, but he was happy. He was camped on the porch of a deserted shop front, opposite the Agni Lingam temple and he was protected by Arunachala. Opening up his haversack, he took out a dry lungi and towel, changed his clothes and placed the wet ones to dry on a nylon rope that was hanging outside the shop shutters. This was good, he felt. He could sit it out in the rain here, get his clothes dried, and early morning, if the rains stopped, he could begin his walk on the Girivalam, with prayers and offerings at the Agni Lingam temple, right here. It must have been nearly 1.30 am, he thought, and he could sleep here, until dawn, without any disturbance. He could see Arunachala getting drenched, and the clouds bowing to its glory. The puzzling aspect was, as he thought back to his father's advice, the thunderstorm was devoid of any lightning tonight. It must have been his prayers, of course, though Balaji to himself with a smile. He spoke a quiet prayer, and turning up to Arunachala, he spoke loudly, "Arunachala, Arunachala Shiva! Nandri, nandri! Thank you. I am in your protection tonight. Thank you for not sending out any lightning to seek me out! I will go back to my father, with your grace and tell him that Arunachala Shiva protected me in this thunderstorm, and did not allow any lightning to get me!" Upon speaking thus, in that dark stormy night, in that deserted shop front, Balaji got ready to lie down and sleep it out, resting his head on his haversack, and covering himself with a shawl that he had brought for this purpose. He must have drifted off to a deep sleep, and must have been in a strange dream, for he could hear some dogs growling nearby and a goat bleating softly. A man was talking and all these animals and the man seemed to be talking to Arunachala. Puzzled, Balaji woke up and sat still, worried and frightened at this very strange dream. He could not see anything. The rain had increased in its intensity. He could not see Arunachala, and this frightened him some more. In panic, he looked at the Agni Lingam temple, and he could barely see the closed gates. He closed his eyes and looked up at Arunachala, and started chanting, "Arunachala! Arunachala! Arunachala!" Pacified a bit, and beginning to breathe normally again, he turned to look for the Agni Lingam temple. There seemed to be someone there, at the gate, ghostly, or not, he could not make out. "Yaar ange? Who is there?" Balaji called out in fright, "The temple is closed. Come into this dry place and get out of the rain. Come here." The person materialized from the pouring rain, and Balaji was calmer. It was an actual person. Not a ghost or demon, as his father had warned him. The man must have also got caught out in the rains and must have been seeking shelter in the rains. The man came walking up to Balaji and seemed to be accompanied by some animal that was following him. It was a goat! So, it was not a dream after all, thought Balaji, in relief. He must have heard this man and the goat calling out, trying to seek shelter from the rain. The man and his goat entered the shelter of the awning and sat quietly. He seemed like a villager from the hills, for he had the appearance of one who would not be from the cities. The goat was huge and very strong, but quiet and docile. It came up on the stairs and sat next to the man from the hills. There seemed to be some sort of a complete understanding between the man and the goat. He was indeed a very strange looking man, Balaji said to himself, for he could see him more clearly now, as he was sitting on the stairs in front of the shop front. He was huge, firstly, and the colour of his skin was unlike anyone that he had seen. Balaji had travelled through India, and in his job as a tour operator at the Chennai international airport, he had seen all sorts of foreigners. This man was certainly not a foreigner, for he was a local man from the hills. His skin was of a deep red colour, very reddish, dark, and not brilliant. He was dressed in some sort of a dhoti, encumbered around his waist, and dropping down to his ankles. Waist-above, he had no cloth or shirt banian of any sort. But, he did not seem to be feeling uncomfortable at all. He did not seem to be noticing the rain or the night or the thunderstorm. He looked very relaxed, and patient and accepting. So was his huge goat that was sitting so very peacefully alongside. The man was watching the Agni Lingam temple very intently and demonstrated some amount of irritation, from time to time, muttering and speaking to himself. Suddenly, he looked up at the peak of Arunachala and grumbled about something, and shook his hands in seeming disgust. And again, he would sit patiently, waiting it out in the darkness of the thunderstorm. After a while, he stood up angrily, looked at the temple, spoke something, almost scolding the temple, and then, turned to the sacred Arunachala, and again, spoke in an irritated manner. Balaji could not understand his speech. He was amazed and surprised that someone so very obviously familiar with the location, with the Agni Lingam temple and the very sacred peak of Arunachala, could be so angry with various aspects. What would it be that made him so very angry, he thought to himself, without talking it out with this strange man from the hills? He was wary about talking to this very strange reddish looking man. He looked large, and moment by moment, he seemed to be appearing larger and larger. It must be his imagination, thought Balaji. He looked at the quiet goat sitting nearby, and he was content and smiled. The goat seemed the same size, and it had not grown. After a while, the man sat down quietly, and did not remonstrate at any aspect, including the temple or the sacred peak. He kept grumbling at times, and started talking to his goat in the unintelligible language that he spoke. The goat sat quietly, happy to be out of the rain. It looked quite happy to have the reddish looking huge man talking in bursts. The goat must have been familiar with this sort of behaviour. Balaji wondered if the man would relax and sleep for a while, for if not, then he would not be getting any sleep until dawn, and he would be very tired in the Girivalam. Getting curious, Balaji decided, that it would be better to talk it out with this strange man. After all, he must have just been some person from the hills nearby, and who was he to wonder about the colour of his skin or the language that he spoke. Taking courage, Balaji spoke, in the local Tamil dialect, "Hello, Saar, you know that you do not have to get upset about the rain. This is the season for rain. But then, who am I to tell you about the rain, for you look like someone from the hills of this region. Do not worry about it. Very soon, it will be daylight, and one can expect that the temple will be opened. If it continues to rain, we can take shelter in the temple. But, it cannot continue to rain like this." The man looked at Balaji, and heard him speak. He did not reply. He turned back to grumbling with himself and continued to talk to his goat. Since he did not get angry, and did not beat him up, Balaji thought, why not take up some more issues? Why not ask him something more about himself? Again, taking courage, Balaji spoke, "Ennaa Saar, do not get angry or upset. This rain will not harm us at all. My father used to tell me that such a thunderstorm was very dangerous, but I am sure that Arunachala Shiva will protect us. Are you from the nearby places? You do not look like you are from Tiruvannamalai or Gingee. Are you from Kanchipuram?" The strange man looked back at Balaji, seeming to understand that he was being asked a question. He chose not to reply again. He looked angrier and angrier, and perhaps, was getting upset with the questions from Balaji, or in his attempts to be drawn into a conversation. He turned back to shaking his hands at the sacred peak of Arunachala, and kept talking to himself, muttering almost angrily, talking to the goat. Balaji decided that it would perhaps be safe to make another attempt. He said, "Do not worry, my friend. This rain will soon stop and you will be able to go and get whatever it is that you are upset about. I am not frightened about this rain, and my father had advised me that I should always be careful about not going out in such a thunderstorm. Do you know why I am not frightened?" Having been asked such a direct question, the strange man looked back at Balaji, and waited, expecting an explanation. He did not ask anything, but the intention was very obvious. Balaji continued, "My father had told me to be frightened about lightning during a thunderstorm. Do you know what I did? The first thing that I did when I got frightened, I prayed to Arunachala, and requested him to protect me from lightning. I was the only person moving around in this heavy rain, and I must have been the only devotee on the Girivalam route, and therefore, it must have been the only prayer tonight. Ha! Ha! Ha! How could Arunachala not refuse me? See for yourself, in this entire thunderstorm, there has not been any lightning, through the night. I knew that Arunachala Shiva would protect me." The huge reddish-looking strange man with the goat looked very startled, on hearing this explanation from Balaji. He seemed to get angrier and perhaps, thought Balaji, he may actually resort to some violence. Why would this strange man be upset that there was no lightning in the thunderstorm, or that Arunachala Shiva was protecting his devotees? The strange man got out of the shade of the shop and walked back to the Agni Lingam temple gate, touched it, and turned back to face the sacred peak of Arunachala, and raised his hands, and spoke something angrily. He did this, 2-3 times, and returned to the shade of the shop front, and sat with his goat, and grumbled. What a puzzling man, thought Balaji. He actually looked angry that there was no lightning in the thunderstorm. What would he want with the temple, and why was he so upset with Arunachala? How could anyone be angry with Shiva himself? Did he not know that he was getting angry with the deity? He could not understand this man. He was actually angry. Let him be, reasoned Balaji. Better to get some sleep, and save himself for the Girivalam. Let this strange man argue it out with Arunachala and let him worry about his answers or any angry reaction from Shiva, he thought. The man came closer to Balaji, and stood facing Arunachala, and spoke, and this time, Balaji seemed to be able to understand, though it was not spoken in Tamil. The strange man spoke angrily to the sacred peak of Arunachala, "How can you allow this? You do not allow me to do my work? What is the wrong that I have done? Do I harm your devotees? Do I stop them when they are on the Girivalam? This is not correct, O Arunachala!" Amazed, Balaji looked at the strange man. He did not actually hear him speak in Tamil. How did he manage to understand what he spoke? Perhaps, it was because he could actually hear him clearly, finally, for he had only been muttering and grumbling in undertones to the goat, and at the Agni Lingam temple and at Arunachala. Who had not allowed this strange man to do his work? How did Arunachala stop him from his work? What was this strange looking reddish man's work? How could his work harm the devotees on the Girivalam? So many questions, he thought. Suddenly, the thunderstorm became more intense, heavier and the sound was angrier. Was Arunachala getting angry with this strange man? Balaji spoke to the strange man, "Swami, why are you angry? I only spoke in jest. I did not mean to stop you from your work. How can I stop you? I do not even know you. Please do not get angry with my Arunachala, and please do not accuse HIM of being wrong. How can HE be wrong? HE is the most graceful." Hearing Balaji, the strange man spoke again, to Arunachala as before, "Did you hear him? He had not even asked you to stop the lightning in a serious prayer. He did not even mean it. And, you stop me from doing my work! It is my job, as given by you and you have denied me, my tasks. He was merely frightened of some rain, that's all. Let me do my job, for, never have you stopped me from doing it. O Arunachala! Let me do my job in this thunderstorm. How can it be a storm without any lightning?" Saying thus, the strange man stood still, and worshipped Arunachala, in a steady chant, and began to relax and drop his anger. As the chant grew in its intensity, he turned to face the sacred peak, and raised his hands and clapped. The sound was enormous; the sound of the claps grew in its volume. Balaji looked on in amazement, and wondered at the man's devotion. Suddenly, the strange man stopped his clapping, and beckoned, and said, "Come, come, O Arunachala, release me from inaction tonight. Release me from not doing my duty tonight." And, in that very instant, the sacred peak of Arunachala looked that much calmer, almost content, and peaceful, within the great rush of the thunderstorm. In the next moment, there were two thick lines of lightning bursting out from the skies, and they were followed by an amazing unstoppable roll of thunder, that kept going on and on. He looked for the strange man, and he saw him, with his goat, walking up the slopes of the sacred peak of Arunachala, in the heavy rains, in the darkness. Balaji did not feel any fear at the sound of the thunder and the sight of the lightning. He sang, "O Arunachala, do not bless me anymore, for I am blessed a thousand and million times in your presence. Let the lightning take me away, to you, to you, to you." In Hindu mythology, Lord Yama or Yamraj is referred to as the god of death. The word Yama stands for twin brother and Lord Yama is Son of Lord Surya and Sanjana. Yama is also known as the lord of justice and is sometimes referred to as Dharma, in reference to his commitment to sustain order. In the Upanishad, Lord Yama is depicted as a teacher and is father of Yudhisthira, the eldest brother of the five Pandavas. It is believed that lord Yama incarnated as Vidura in the Mahabharata period. Lord Yama is the definitive controller of lord Shiva and lord Vishnu. He is supposed to carry a huge lasso with which he drags each being at the time of death to face heaven or hell according to the being's karma. The Vahana of Lord Yama is a black water buffalo and guardian of the south direction. As one of the Arunachala girivalam asta Lingams, Yama Lingam is situated beside cremation grounds on Chengam road. The dominant Navagraha of this Lingam is, Mangala (Mars). 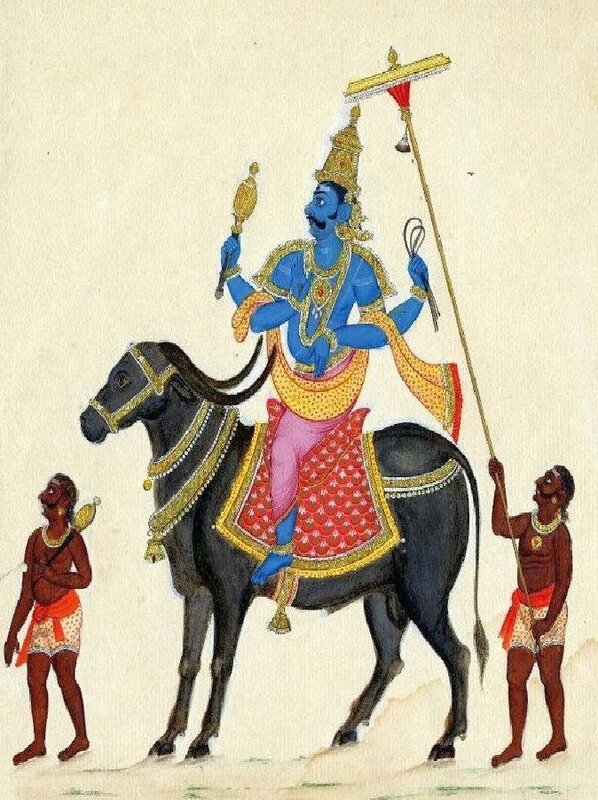 Yama is portrayed sitting on his mount, a powerful black buffalo named Mahishan with two monstrous dogs by his side. Devotees get rid of their financial constraints worshipping the Yama Lingam. Worshipping at this Lingam is also conducive for addressing karmic constraints and ensuring longevity of life span. "Arunachala!" He called out, "pray, give me strength, to seek you, again and again!" Dinesh was tired and called out, in his mind, to the sacred Arunachala, to give him strength while on the Girivalam. He smiled at the priest at the Yama Lingam temple and thanked him as he received blessings from the sacred camphor fire. Why did he call out in such a manner, he wondered, for this was only the second of the ashtalingams on the Girivalam route, and he had to visit the other six, not including the Surya and Chandra Lingams. Upon completion, he would also go to visit Shiva at the Tiruvannamalai temple, one of the five pancha-bhoota-lingams. The elderly priest of the Yama Lingam temple smiled at Dinesh, and began to close the doors to the inner sanctum. It was almost noon and it was time to get some rest. He would find it difficult to keep walking on the Girivalam route, and it would be sensible to rest it out in the outer sanctum of the Yama Lingam temple, Dinesh thought. This was his first attempt to take the sacred walk around the holy Arunachala at Tiruvannamalai. Against all advice, he had started his walk on the Girivalam route at 9.00 am. After a prayer at the Agni Lingam temple and a brief stop and visit to Sri Ramanashram, he had barely made it in time for the prayers at the Yama Lingam temple. It was too hot outside, in this summer month. "Take some rest here," said the priest, "Take a small nap or chant your beads in offering to Arunachala. Do not go out in the sun." Dinesh was thankful, and watched the old priest settle down on the running seat-ledges that were all around the open outer sanctum of the Yama Lingam temple. 25 year-old Dinesh bowed to the old priest in respect, went back to the inner sanctum gate, worshipped loudly, reciting some 4-5 stotrams that he knew, picked up the sacred ash and applied it on his forehead. Taking out some money from his wallet, he pushed it into the hundi box. The priest did not watch him, intent as he was, in arranging a small coir mattress on the seat ledge and got ready to take his nap. He gestured for Dinesh to lie down or sit at the seat-ledge alongside. It did seem very welcoming to accept the invitation. It was too hot outside, and he could see that the road was totally deserted except for a random vehicle going towards Tiruvannamalai. Dinesh went to one of the seat-ledges, rolled out a towel that he had brought with him, placed his small handbag as a head cushion and lay down, hoping to get some rest. He was worried. This was a temple, and any which way that one would lie down, the direction of the feet may be disrespectful. Disturbed, he sat up, and quietly kept chanting, "Arunachala! Arunachala! Arunachala!" He thought it may be best to imitate the priest and keep his feet in a similar direction, pointing away from the sanctum, and away from the sacred peak of Arunachala. Some mendicants were also resting in the open sanctum of the Yama Lingam temple. On the shaded outer areas, there were some buffaloes resting alongside the wall. They seemed content, resting in the shade, waiting it out through their noon siesta. As he watched, from the scrub forests near the temple, a huge buffalo came waddling slowly, followed by a tall cowherd, an elderly looking man, swarthy, and dressed only in his loin cloth. His head was covered in some sort of a headgear, and complete with his huge bristling handlebar moustache, he was quite a fearsome character. The huge buffalo came to rest with the other ones, along the shaded side of the Yama Lingam temple. The fearsome looking cowherd walked into the open sanctum of the temple and chose to sit on the seat-ledge alongside of the one where Dinesh was seated. Feeling a strange sort of panic, Dinesh kept chanting silently. Up close, he could see that the fearsome looking cowherd was a very normal person, a local villager, and not at all frightening in any manner. Dinesh had seen many such cowherds in Madurai rural areas (his native place) and relaxed. The tall cowherd glanced at Dinesh, examined him closely and made him out to be a pilgrim on the Girivalam route. Instantly, on impulse, he asked, "Enna? Why are you out on the Girivalam in this hot mid-afternoon? See, even my buffaloes have need for shade and rest at such times. Take some rest. Go to sleep. Go afterwards, in the evening. You will be able to walk easily and you can worship Arunachala with more devotion. Go to sleep, now!" It seemed almost like a command, and Dinesh immediately obeyed. The tall cowherd also did the same, and went off into a snoring slumber. Dinesh drifted off into sleep. His dreams were floating from one perspective to the other. He kept imagining himself on the Girivalam route, walking along with the priest from the Yama Lingam temple. After a while, he dreamt that the mendicants were walking along with him, and later, they were all riding the buffaloes. The mendicants disappeared soon after, and the tall cowherd was walking along with him. This dream was followed by a vision of the tall cowherd astride the really huge buffalo. In his dreams, the tall cowherd was beginning to get larger and larger, and the buffalo was also becoming enormous. The cowherd was saying something, and since Dinesh did not answer, he was being shaken by the shoulder. He woke up with a start, and indeed, the tall cowherd was standing alongside, and shaking him by the shoulder. Alarmed, Dinesh sat up and asked about the matter. The tall cowherd said, "Thambi, you were calling out in your sleep. You seemed to be having some fearful dream. See, your prayer beads have also slipped out from your hands and fallen on the ground. Pick them up. Drink some water." Calmer, Dinesh picked up the prayer beads and had some water from the bottle that he carried. Wanting to share, he offered the bottle of water to the tall cowherd and also passed on a couple of small bananas. The tall cowherd accepted the water and bananas with a smile and said a word of blessing to Dinesh, and went back to sleep. Dinesh tried to sleep, and surprisingly found that he was able to easily go back to deep slumber. The fear factor of the tall cowherd was gone and he began to dream about himself, about his family and his native Madurai. He could see events in his life in a very clear manner, and he found himself wandering into the actual happenings. He saw his childhood in Mumbai, Chennai and Madurai, and saw his relatives, friends and neighbours. He saw himself wandering through the various schools and classes where he had studied, and watched himself playing cricket with his only brother and friends. It was strange, as he could see himself, as an elder person, 25 years old, and he could see the other aspect of himself, as a five year old, or as a ten year old. He could see his father, grandfather and aunts and uncles and similarly, he could see his brother at different ages. There were people who were no longer with him now, and they had passed on to a higher plain during the past many years. He could see them, as though they were alive, and he could watch them talking to him, when he was at a younger age. Dinesh felt very happy and content, and wanted to continue to sleep, and did not want to wake up. It was amazing, and it felt very real. Those who had passed on, were very much active and real, within his sleep and inside his dreams. Feeling pleasant, but disturbed at the various images, Dinesh woke up. He was back in the open sanctum of the Yama Lingam temple and nothing had changed. He was as yet a 25 year old young man, and his prayer beads were with him. The tall cowherd was sitting nearby, eating the bananas, watching his buffaloes. The huge buffalo was walking about and changing its location. It seemed as though that the huge buffalo wanted to be able to see the tall cowherd from where he sat down. The elderly tall cowherd noticed the fact that Dinesh had woken up and was sitting in a disturbed manner, and he came nearby and asked him, "Enna Thambi, what's wrong? Why are you looking sad and depressed? What happened?" Dinesh thought to himself. What the heck! It would not harm anything by talking to this cowherd. He does not know me, and I do not know him. I can talk to him about anything and walk away on the Girivalam route, and that will be the end of this relationship. So, he replied, "Thatha, it is nothing. I was dreaming about my younger days when I slept. I dreamt about people and I dreamt about those who were no longer alive. But, in the dreams, they were all present and it seemed that they were very much alive. I was talking to them, as a younger person, but I was also present there, as an elder person. I could see that there were two images of myself. It was very strange, and I felt disturbed. I woke up, suddenly." The elderly tall cowherd smiled, and said, "Thambi, why do you get frightened? You should feel happy, that you were just able to go to sleep for such a short while, and spent time with your loved ones. I can only see my buffaloes in my sleep, and that huge one out there, even in my sleep, keeps pushing me and keeps asking me for something or the other. I have tried beating him up in my sleep, but he is very shameless. In real life, I have never beaten him. He is a very lovable character and very intelligent. But in my sleep, he is a big idiot. I am always very terrified of going to sleep. But, you should consider yourself to be very lucky." Dinesh smiled and watched the huge buffalo moving about. It was amusing to think of the buffalo as a peaceful character in real life, when it did not look like one at all, and to think of it as an unpleasant character in a dream, was really intriguing. The elderly tall cowherd was also looking at the buffalo and smiling. How would one actually dream about a buffalo? Dinesh asked the elderly tall cowherd, "You really see your buffalo in the dream? Do you talk to him? Does he talk back to you?" The cowherd laughed loudly, and replied, "Yes. Sometimes he talks to me. I talk to him. I wonder what happens in his dreams. In mine, he comes to me and asks me to return home, and tells me that I should go back to my family. But, I have no family. For many years, I am alone. This huge buffalo is all that I have. The other buffaloes are not mine. They belong to different families in the village. I move around nearby. We get food when we get it, and there are small food cafes on the Girivalam route, and they know us, and we get our food from them. We do not have to pay them." Amazed, Dinesh asked, "You have nobody? What about your family? They must be somewhere. Your buffalo is your only companion? Wow. You are almost like me, then. My only close relative is my brother. I have no other brothers or sisters. But, my brother is away from me, married and settled well. He has his own life to take care of. I lost my mother when I was just an infant and my younger brother was only a toddler. I do not know what happened. Everyone tells me a different story. I have come to the stage where I do not know who to believe and what to believe. I am happy with myself." The elderly tall cowherd looked genuinely concerned at Dinesh's story. He commented, "Arunachala! O Arunachala! What is this? You are so young. Your life has not even begun. I have lived something that must be more than a hundred years, I think. I do not even remember when I was born. I do not need any family now. But, you! You have not even started on your life. You do not know your mother, at all? For me, I do not remember my mother, but I know that she was there sometime in my life, and I remember her in my youth, but I cannot picture her. But, I am happy for her, and for her memory, because I know that she was happy when she was alive." Dinesh smiled, and nodded in agreement. He wondered as to why it was so easy to talk to with strange elderly man, sitting in nothing but a loincloth, accompanied by a huge buffalo who was grazing nearby. What was it that made him talk to such a stranger on the first instance, and he could not as yet talk to his various uncles and aunts who had taken care of him and his brother through their younger days? Nobody had denied them anything. They had been made to feel as though they were part of each family that they had lived with at some period of their lives. They had been as equal to the children of their uncles and aunts and never made to feel inferior. Why was he talking to this strange man about all this? Dinesh said, "You know, you are very correct when you said that you are only able to talk to your buffalo. I am not even that lucky. I have no memory of my mother. I do not know about my younger brother. He was smaller than me. Whenever I sleep, and when I dream, I can see my cousins, and my uncles and aunts, and they are all as pleasant in my dreams as they are when I am awake. Nobody every denied us anything. My mother's brothers and sisters have always taken care of whatever we would want. We have attended the best schools and colleges." "Sometimes, I try. I try to seek out my mother in my sleep. Sometimes, I try to create an image of her. But, I fail every time. What do you do, Thatha? Can you pull back memories of your mother? At least you know that she existed," Dinesh asked, "Once I asked my brother, but I feel that he is luckier than me. He is fortunate because he would have no impression. Now he is married, and he has a child, and he would see the relationship between the child and the mother. He will see the love and he will see the demands made by the child. He will see how the mother rushes to satisfy the child. I keep thinking about what my brother would be thinking." The elderly tall cowherd replied, thoughtfully, "Thambi, I know what is it that you are asking, but I have no answers. I am not an educated person. Several people had tried to put me in a school, but I would always run away and keep roaming about with my buffaloes. Through my life, the only single aspect that I remember about myself is that, I have always had a buffalo with me! I keep talking to myself, and sometimes, people think that I am mindless, but my buffalo has no problems with my behaviour. I have learnt a simple trick when I get sad and depressed when asleep. I wake up very fast, and I walk around. I do not continue to sleep. If you do that, you are at the edge of terrible impulses." Dinesh sat quietly, thinking, and thought - why not ... let's see what this man says about my innermost fears. He asked, "There are times, sometimes when I have woken up and been scared. I am all alone, and I see everyone taking care of their families. I feel the loneliness and the pain of being alone in my thoughts. My uncles and aunts may be thinking that I have grown up and that I am a married man, and I should be left alone. But, I am indeed alone inside my mind. Sometimes, I feel that I should just go away, and sometimes, I feel that this life is not worth living. I should just put an end to it." The elderly tall cowherd spoke angrily, "What sort of nonsense is that? Your life is not yours. Your life belongs to Arunachala. Even death has no control over your life. Do you know that? Give yourself up, to Arunachala. You have no right to give up on yourself, by your own decisions. We will come and go, and many more generations will come and go. Before the first man was born, there was Arunachala. Talk to him, when in doubt, and talk to him, when happy. He is the cause of your happiness. He is the cause of your worries, because he wants you to see deep within yourself. There is no sadness or depression in life. It is the manner in which you see yourself." "Do not at any moment think that you can give up on yourself, and give up on your life," the elderly cowherd said, standing up, and waving his hands at the sacred peak of Arunachala, "Look at the Girivalam and learn from it today. When you walk, you start at the beginning. But, what is the reason that you walk on the Girivalam? It is not in homage to Arunachala alone that you walk on this sacred path. You walk, and so do hundreds of thousands who come here, you walk, in order to return to the beginning. Every aspect has a beginning, and the path has only purpose. It is to take you back to the beginning. When you realize that, you know the truth. You are on the path, to reach the beginning of another journey. That's all. It is that simple. There is never any end, for Maheshwara, Arunachala, Shiva, is waiting, even in death, to return you to the beginning of another path."